Hillary Kimaiyo had no competition to push him but recorded an impressive 1:03:17 in winning the 19th edition of the race. Kimaiyo and Julius Ketter got away from the beginning but Kimaiyo then opened up such a gap on Ketter that it looked like he would break the course record. He eventually fell short by 14 seconds, but had obviously recovered well from his 2:13 win in the Mexico City Marathon three weeks earlier, where he also finished ahead of Julius Ketter. It was a familiar result, with Kenyan winners of both races, but Adriana Fernández fought hard with the Kenyans Kimaiyo and Lucy Njeri, finishing ahead of Njeri and her Mexican rivals and only 30 seconds behind Kimaiyo. With this performance Fernandez will be contesting the World Half Marathon Championships in Rio de Janeiro on 12 October. In 4th and 5th places in the men's race Julio César Pérez Morales and Alejandro Cuauhtepitzi won the places available for the men's event. Around 3500 runners started, probably along with another thousand without race numbers. 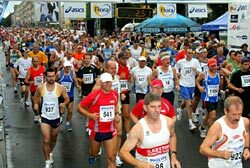 The race limit had been reached the day before and a long waiting list had grown of those hoping to join the great running festival. There were also some exciting races in the youth and visually impaired categories. 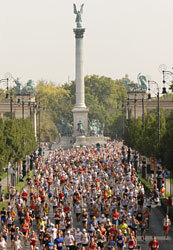 The race was incorporated the Polish half marathon championships. In total 1213 runners completed, coming from 13 different countries. 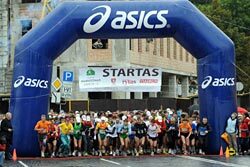 There were 5000 individual finishers and overall almost 7000 runners took part in the 23rd edition. 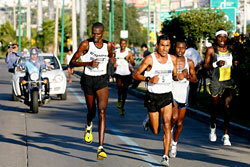 Besides the half marathon runners could also choose to run the race in a team of two. There was a 3.5km fun run for children and family members. This year featured a new course along the river Danube and through the city centre, past the main sights of the city, including World Heritage sites. This race is for amateur runners, and no elite runners were invited. 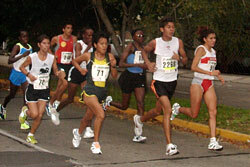 More than 1000 runners came from abroad, mainly from the United Kingdom, Germany and Italy, France, Denmark and the USA. There were runners even from such far away countries as New Zealand, Israel and Mexico. The race incorporated the Russian Championships, and offered $5000 prize money to each winner, both of whom came close to the course records. In cool (9°C) conditons 700 runners ran over the six-lap course. The Rybakov twins performed exceptionally, and an unexpectedly fast run from Mikhael Lemaev relegated the course record holder and defending champion Sammy Kipkoech to third place. In the women's race youth prevailed over experience as 40-year old Irina Permitina could not quite match the finishing pace of Olesya Syreva, 15 years her junior. A total of around 20,000 runners took part in all events of the Siberian Running Festival, of which the Half Marathon was the showcase. 664 men and 55 women finished the race. 26 year old Zimbabwean, Point Chaza broke his own record by over two minutes and walked away with USD1000 in prize money. 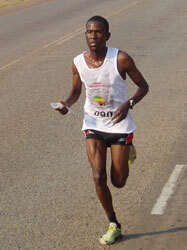 He shook off fierce competition from one-time marathon winner, Tapiwa Chingadayi of the Zimbabwe Prison Service. Tabitha Tsatsa (36) of the Zimbabwe Republic Police club clocked in just a minute slower than her winning time of last year. Second placer Lizzy Chikore won USD500 while USD250 went to third-placed Monica Kativu. Chikore is also preparing for the Greatest Race on Earth, the first sta ge of which will be held in Nairobi on 26 0ctober. "I am training very hard, and going up the Christmas Pass has given me exposure to hilly terrains." 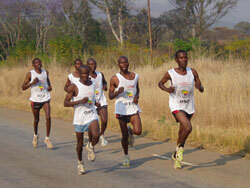 The race started at the Africa University campus and ended at the Mutare Sports Club. Chaza took a decisive lead before halfway, after overtaking Chingadayi and Felix Musvuurwa. He maintained his lead to become the first person to reach the Christmas Pass summit, for which he won an additional prize and was crowned King of the Christmas Pass. "Going up the Christmas Pass last year was a real challenge, but today, I felt strong." 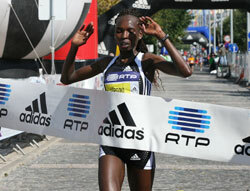 Tsatsa won the Queen of the Christmas Pass title and was fresh from representing Zimbabwe at the Beijing Olympics. "I eat kilometres for a living," said Tsatsa just after the race. "The hilly terrain to me is like any challenge — it has to be overcome." Tsatsa is based in South Africa and is scheduled to compete in the Dublin Marathon on 27 October. Africa University's Interim Vice Chancellor, Professor Fanuel Tagwira said the marathon event was conceptualized in 2002 to serve as a platform for the promotion of peace across the world. He also said it was part of the University's multifaceted approach to seeking lasting solutions to the challenges facing the continent. The race saw about 200 athletes competing in the various categories; apart from the Marathon and half marathon there was a 10km race for the physically challenged, a 5km race for primary school children and a 500m fun run for peace. Kenyans Sammy Kitwara and Peninah Arusei took top honours in the 24th edition of the classic "Dam to Dam" race held over 10 miles (16.093km) in the largest running event held in Holland, with over 35,000 runners. Benjamin Serem won the marathon from 1553 others in his debut race. The women-only half marathon attracted 1046 participants. Hillary Kimaiyo took the lead from the gun and recorded the fastest time run in a Mexican marathon this year, running by himself writes Ruben Romero. Kimaiyio clocked 2:11:47, breaking Simon Sawe's previous record by five minutes, and finishing six minutes before his closest competitor. Despite running alone Kimaiyo paced himself well, running the first downhill half in 1:05:30 and came back with 1:06:17 for the second half. 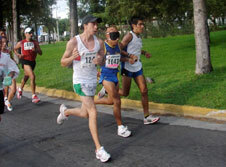 The new record of the oldest marathon in Mexico, located in the heart of the country, is particularly significant because the City of Leon is at an altitude of 1800m. The women's winner, Sara Cedillo, finished well outside Viola Bor's course record of 2:37:21. This year's marathon, which celebrates the Independence of Mexico, attracted 1722 runners, about 15% up on last year, but the high point of the "marathon weekend" was the kids' race, in which some 1400 children of all ages ran appropriate distances. The registration fee was to donate a toy, which will be given to kids from poor families in the City. Haile Gebrselassie did everything expected of him and more. He broke the world record and in addition just managed to squeeze under 2:04. Meanwhile Irina Mikitenko captured a home win and national record for Germany in exceeding her own expectations to win in 2:19:19, just outside Mizuko Noguchi's course record. From the start Gebrselassie was taken out on pace, tucked into a group of seven, including four pacemakers, who passed 5km in 14:34. By 10km (29:13) all that had happened was that the leaders had drawn ever further clear of the second group, now 200m or more further down the road. Weather conditions were ideal, 12°C, sunny through hazy cloud, and little wind. The leade group progressed uneventfully through the first half of the race to record 1:02:04 at halfway, whereupon one of the pacers dropped out. Another departed at 25km, and another at 30km, but there was still one of them left, alongside three contenders: Gebrselassie, Charles Kamathi and James Kwambai, running ambitiously fast for his deceptive personal best of 2:10:20. But the pacemaker dropped out and Kamathi dropped back just after 31km. It was now Gebrselassie and Kwambai, shoulder to shoulder. 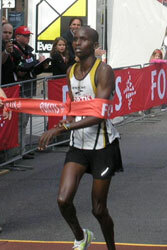 Kwambai was not fazed and strode onto the Kufurstendamm a couple of metres ahead of the world record holder, at 34km. Although Gebrselassie had finished fast over the closing kilometres in setting the record on the same course a year earlier he seemed to be matching that effort a crucial few seconds up on the schedule. His pace was on for about 2:04:20 at 36km, but he must have felt the margin for error was too slender as from there he pushed on, immediately gaining 20m on Kwambai, and by 38km he was 15 seconds ahead. The 2:04 barrier was now in his sights, and it says much for Gebrselassie's resolve that he stuck so assiduously to the task. He passed through the Brandenburg Gate, with 390m to go, as the clock registered 2:03. Eventually he breezed under the banner with a couple of seconds to spare, although the official time was rounded up to 2:03:59. Irina Mikitenko ran her own race in a different way, allowing Helena Kiprop to blaze her way through the first half in 1:09:37 (an unofficial personal best time). She took Askale Magarsa with her, but Rose Cheruiyot dropped back after 15km and passed through halfway in 1:10:05, alongside Mikitenko and her phalanx of male pacers. From there on Mikitenko gradually cut back the leading pair, and when she caught them Magarsa could only briefly track her, as they passed through 30km together in 1:39:36. 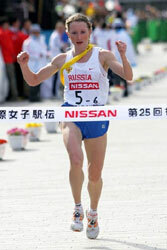 From there on it was all Mikitenko, unheedful of her husband's advice to keep the pace steady. "After 35km, I am the boss. I know what I am capable of" she would say later in the press conference. 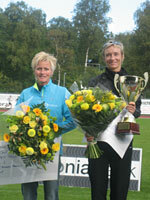 She came down the finishing straight to tumultuous applause and a new German national record. Both Silas Sang and Rita Jeptoo broke the course records despite the windy conditions writes Antonio Manuel Fernandes. More than 15,000 runners started, including the Portuguese Prime Minister Jose Socrates who completed the 8km fun run before presenting prizes. Kenyans dominated the half marathon from the start on the Vasco da Gama bridge. By 12km the lead group was down to six but everything was decided in the last 5km with the most unlikely contender, Silas Sang, finishing seven seconds ahead of 39-year-old Paul Tergat. But Tergat was pleased: "this was a great test of my performance" he said. The Olympic marathon silver medallist, Moroccan Jaouad Gharib, was the first non-Kenyan in the race while the first Portuguese was Hermano Ferreira, in a distant 16th place (1:05:09). In the women's race Rita Jeptoo, third at the Boston Marathon this year, ran a personal best to break Margaret Okayo's course record from 2004 by five seconds. "This was a good but difficult test" said Jeptoo. "It was too windy. I'm in good shape but I was not expecting this." Portuguese Inês Monteiro was fourth, with a solid 1:11:33 run, ahead of her countrywoman Dulce Félix. Elija Tarus and Mercy Kibarus took the titles at the ninth edition, held in ideal weather conditions writes Diego Sampaolo. Tarus ran a new course record of 1:01:59, 25 seconds faster than John Kiprotich's time of last year — and nearly three mnutes faster than his previous best. Kibarus, a mother of two children, beat former New York, London and Boston Marathon winner Margaret Okayo who is returning to competitions after being sidelined for some years by a series of injuries. The men's race started slowly, but Tarus picked up the pace at 9km and passed through 10km in 29:28. By 15km he had increased his lead and on course record pace with his split of 44:04. 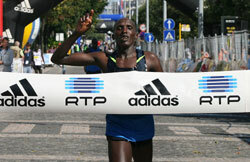 Tarus plans to return to Turin for the Marathon on 19 April. 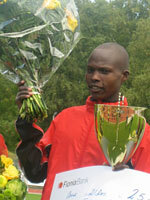 Mercy Kibarus comes from the same training group as Tarus, guided by Gabriele Nicola in Iten. Kibarus pulled away from Okayo as early as 6km, leaving both her and Turin Marathon winner Vicenza Sicari increasingly far behind. She also plans to run the Marathon in Turin next year. Kibarus began running seriously only some months ago after the Abu Dhabi Half Marathon. "The problem was that she needed to look after her children" said Nicola. "I promised her to pay a baby-sitter who could take care of them." Okayo finished second in in 1:14:06. "I am planning to run a Marathon race this autumn. I would be very happy to run 2:29 after many injuries," said Okayo. The city of Utrecht had its origins in the stone age and received city rights in 1122. The tower of Dom Church, constructed over a hundred-year period [1320-1420], dominates the skyline of this charming city on the Rhine River. The Singelloop 10km race was first run back in 1925, and this year was the 58th running. On a perfect September "Indian summer" day the elite athletes who headed the field of 5,500 runners posted some very fast times. The field overall was 60% up on the previous year, and looks set to grow further in future editions. Mulu Seboka set a new course record and personal best, taking over four minutes off Asha Gigi's time of last year writes Paul Gains. The 07:30 start temperature was 17°C and humidity over 90%. This did not deter Seboka, a three-time winner of the Mumbai Marathon. The lead group passed 10km in 35:05 and halfway in 1:13:49, but in the second half encountered strong winds off Lake Ontario. 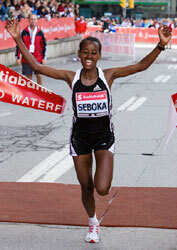 Seboka started to forge her lead after 33km, shaking off Gigi and Kenya's Caroline Cheptanui to claim the $CAD 20,000 first place prize and an undisclosed amount for beating 2:30. Overlooked in the pre-race speculation, Seboka commented "I don't care who the favourites are, I just tried from the start to do my job, and it happened. It's a fantastic course and the crowd was impressive — but the wind was hard." Olena Shurkhno of the Ukraine moved through the field during the last 10km to eventually claim second place in a new personal best of 2:30:13. The duel between men's defending champion and record holder John Kelai of Kenya and Ethiopia's Tariku Jufar failed to materialise. A $25,000 bonus was on offer for a sub-2:09 time and pacemakers were set up for a first half in 63:40. But the favourites failed to respond — passing halfway a minute slower than scheduled. Two of the pacemakers went right through to 32km before dropping out. At this point a pair of Kenyans, Peter Kiprotich and Kenneth Mungara were left alone at the front. 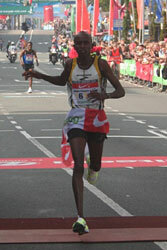 Mungara, the winner of the 2008 Prague Marathon, pulled away over the last 300m for a two-second victory. Kelai faded to fifth, while Jufar struggled home in 2:18:47 for 13th place. The ninth edition confirmed the race's reputation as the fastest Half Marathon in Italy writes Diego Sampaolo. On a new course Benson Barus set a new personal best and Udine Half Marathon record. 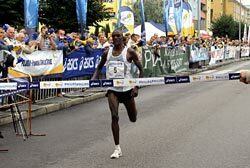 The World Half Marathon Championships held on a three-lap course in Udine a year ago had faster times but the event record was Patrick Ivuti's 59:45 in 2002. "I felt ready to tackle this race," said Barus. "I liked the course and the support I received along the streets of Udine. My goal was to go under one hour. John Kiprotich also broke the one-hour barrier running an impressive new 59:44 personal best. Hungarian Aniko Kalovics won the race for the second time in her career after her victory in 2006. "This is an important win because I did not really expect it," said Kalovics. "I have trained well for my next Marathon (Venice, 26 October). I really liked the new course in Udine. The first 10 km were harder, then I ran more relaxed." 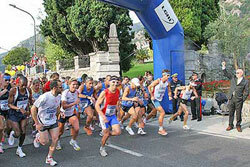 On a morning ideal for running, 1670 gathered at the start line in Limone Sul Garda and after passing along the scenic lakeshore through Riva del Garda, 1436 of them crossed the finish line in Malcesine. 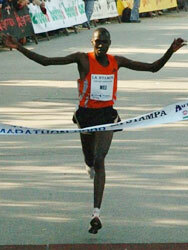 Philemon Kipketer outran last year's winner Metto Kipkering to win by 100m. 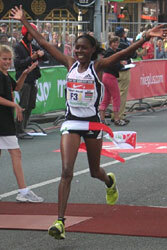 The women's race was dominated by the Trentino runner Monica Carlin.